Far-right politics are right-wing politics further on the right of the left-right spectrum than the standard political right. Far-right politics often involve a focus on tradition, real or imagined, as opposed to policies and customs that are regarded as reflective of modernism. Many far-right ideologies have a disregard or disdain for egalitarianism, if not overt support for social hierarchy, elements of social conservatism and opposition to most forms of liberalism and socialism. The term is commonly used to describe right-wing populist ideologies known for extreme nationalism and opposition to immigration, as well as Nazism, neo-Nazism, fascism, neo-fascism and other ideologies or organizations that feature extreme nationalist, chauvinist, xenophobic, racist, or reactionary views, which can lead to oppression and violence against groups of people based on their supposed inferiority, or their perceived threat to the nation, state or ultraconservative traditional social institutions. The term "far-right" has been used to describe right-wing populist ideologies known for opposition to immigration and for nationalism, in addition to being applied to neo-fascists and Neo-Nazis. Charles Grant, director of the Centre for European Reform in London, distinguished between right-wing nationalist parties often described as "far-right", such as National Front in France, and fascism. Major elements of fascism have been deemed clearly far-right, such as its belief that supposedly superior people have the right to dominate society while purging allegedly inferior elements, and—in the case of Nazism—genocide of people deemed to be inferior. Far-right politics commonly include aspects of authoritarianism, anti-communism, and nativism. Claims that superior people should proportionally have greater rights than inferior people are sometimes associated with the far right. The far right has historically favoured an elitist society based on belief of the legitimacy of the rule of a supposed superior minority over the inferior masses. However, right-wing populist ideologies described by some commentators as "far-right" often use appeals to the "common man" as opposed to the elites. Far-right politics sometimes involves anti-immigration and anti-integration stances towards groups that are deemed inferior and undesirable. Concerning the socio-cultural dimension (nationality, culture and migration), one far-right position could be the view that certain ethnic, racial or religious groups should stay separate, and that the interests of one's own group should be prioritised. 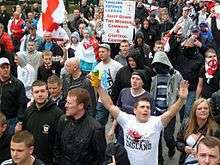 An English Defence League demonstration in Newcastle, England. The placard reads "Shut down the Mosque". According to Christina Liang, this "academic field is especially peculiar about its terminology. Each label carries with it a specific understanding of this family of political parties as well as a particular set of assumptions regarding their origins and electoral success". In an extensive survey of the literature, academic Cas Mudde found 26 definitions of right-wing extremism that contained 57 different ideological features. Alongside the theoretical debate concerning the nature of these parties there is also an empirical debate concerning who speaks for right-wing extremist parties and how to measure their ideology given that many reject the right-wing extremist label being applied to them. One issue when it comes to terminology is whether parties should be labelled "radical" or "extreme", a distinction that is made by the Federal Constitutional Court of Germany when determining whether a party can be banned. Another question is the what the label "right" implies when applied to the extreme right, given that many parties labelled as right-wing extremist tended to advance neoliberal and free market agendas as late as the 1980s but can now advocate economic policies more traditionally associated with the left, such as anti-globalisation, nationalisation and protectionism. One approach, drawing on the writings of Norberto Bobbio, argues that attitudes towards equality are what distinguish between left and right and therefore allow these parties to be positioned on the right of the political spectrum. There is also debate about how appropriate the labels fascist or neo-Fascist are. According to Cas Mudde, "the labels Neo-Nazi and to a lesser extent neo-Fascism are now used exclusively for parties and groups that explicitly state a desire to restore the Third Reich or quote historical National Socialism as their ideological influence". Jurgen Falter and Siegfried Schumann define right-wing extremism with reference to ten ideological features which they believe constitutes a core extreme right ideology, including hyper-nationalism, ethnocentralism, anti-communism, anti-parliamentarianism and anti-pluralism. Cas Mudde identified five key features of the "extreme right"—nationalism, racism, xenophobia, anti-democracy and the belief in a strong state—based on the fact that they appear in 50% of the definitions of the extreme-right that he surveyed. Mudde lists "nativism, authoritarianism, and populism" as core elements of populist radical right political parties and associated movements. Mudde adds: "the terms neo-Nazism and to a lesser extent neo-Fascism are now used exclusively for parties and groups that explicitly state a desire to restore the Third Reich (in the case of neo-Fascism the Italian Social Republic) or quote historical National Socialism (fascism) as their ideological influence". According to Elisabeth Carter, the two defining features of a right-wing extremist party are: a rejection of fundamental human equality, which she asserts is what makes the party right-wing, and a rejection of the fundamental democratic values of the state, which makes it extremist. Proponents of the horseshoe theory interpretation of the left-right spectrum identify the far-left and far-right as having more in common with each other as extremists than each have towards moderate centrists. In the United States, the term hard right has been used to describe groups such as the Tea Party movement and the Patriot movement. The term has also been used to describe ideologies such as Paleoconservatism, Dominion Theology and White nationalism. From 1945 to the mid-1950s, far-right parties were marginalised, and their ideologies were discredited due to the recent existence and defeat of Nazism. Thus in the years immediately following World War II, the main objective of far-right parties was survival; achieving any political impact at all, was largely not expected. From the mid-1950s to the 1970s, the so-called "populist protest phase" emerged with sporadic electoral success. Far-right parties during this period drew to them charismatic leaders whose profound mistrust of the political establishment led to an "us-versus-them" mind set: "us" being the nation's citizenry, "them," the politicians and bureaucrats currently in-office; beginning in the 1980s, electoral success of far-right political candidates made it possible to revitalize anti-immigration as a mainstream issue. Jens Rydgren describes a number of theories as to why individuals support far-right political parties, and the academic literature on this topic distinguishes between demand-side theories that have changed the "interests, emotions, attitudes and preferences of voters" and supply-side theories focusing on the programmes of parties, their organisation and the opportunity structures within individual political systems. The most common demand-side theories are social breakdown thesis, the relative deprivation thesis, modernisation losers thesis and the ethnic competition thesis. The rise of far-right political parties has also been viewed as a rejection of post-materialist values on the part of some voters. This theory known as the reverse post-material thesis would blame left-wing and progressive parties for embracing a post-material agenda (including feminism and environmentalism) that alienates traditional working class voters. Another study argues that individuals that join far-right parties determine whether or not the party will develop into major political players or remain marginal. Early academic studies adopted psychoanalytic explanations for the far-right support. For example, the 1933 publication The Mass Psychology of Fascism by Wilhelm Reich argued the theory that fascists came to power in Germany as a result of sexual repression. For some far-right political parties in Western Europe, the issue of immigration has become the dominant issue among them, so much so that some scholars refer to these parties as "anti-immigrant" parties. Right-wing terrorism is terrorism motivated by a variety of far right ideologies and beliefs, including anti-communism, neo-fascism, neo-Nazism, racism, xenophobia and opposition to immigration. This type of terrorism has been sporadic, with little or no international cooperation. Modern right-wing terrorism first appeared in western Europe in the 1980s and in eastern Europe following the dissolution of the Soviet Union. Right-wing terrorists aim to overthrow governments and replace them with nationalist or fascist-oriented governments. The core of this movement includes neo-fascist skinheads, far right hooligans, youth sympathisers and intellectual guides who believe that the state must rid itself of foreign elements in order to protect rightful citizens. However, they usually lack a rigid ideology. Supporters of the historic Russian far-right monarchist and antisemitic ultranationalist Black Hundreds movement marching in 1905. 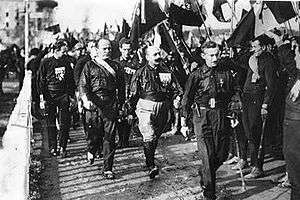 Blackshirts of the National Fascist Party led by Benito Mussolini during the March on Rome in 1922. Members of the Ku Klux Klan (KKK), an American far-right white supremacist group, marching in a mass rally in Washington, D.C. in 1928. Nazis alongside members of the far-right reactionary and monarchist German National People's Party (DNVP), in 1931 during the Nazi-DNVP alliance in the Harzburg Front. Merkl, Peter H.; Weinberg, Leonard. Right-wing Extremism in the Twenty-first Century. Frank Cass Publishers. Parsons, Craig; Smeedling, Timothy M. (2006). Immigration and the transformation of Europe. Cambridge University Press. Woshinsky, Oliver H. (2008). Explaining Politics: Culture, Institutions, and Political Behavior. Routledge. 1 2 3 Baker, Peter (2016-05-28). "Rise of Donald Trump Tracks Growing Debate Over Global Fascism". The New York Times. ISSN 0362-4331. Retrieved 2016-06-07. ↑ Peter Davies; Derek Lynch (2002). The Routledge Companion to Fascism and the Far Right. Psychology Press. ISBN 978-0-415-21494-0. Retrieved 19 August 2011. In addition, conservative Christians often endorsed far-right remines as the lesser of two evils, especially when confronted with militant atheism in the USSR. ↑ William Safire. Safire's Political Dictionary. Oxford, England, UK: Oxford University Press, 2008. p. 385. ↑ Klaus von Beyme: "Right-wing extremism in post-war Europe". In: West European Politics 11 (1988:2), 2–18. ↑ Art, David (2011). Inside the Radical Right. New York: Cambridge University Press. ↑ Allen, Trevor J. (8 July 2015). "All in the party family? Comparing far right voters in Western and Post-Communist Europe". Party Politics. doi:10.1177/1354068815593457. ISSN 1354-0688.